Welcome to Poltergeist Works official website! Poltergeist Works is my custom knife workshop located in Poland. 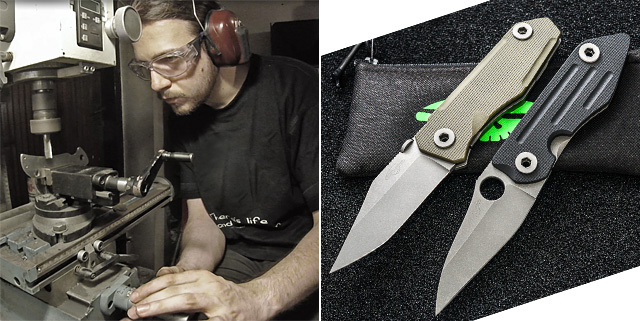 I use the highest quality powder metalurgy steels, tool steel, GRADE 5 titanium aswell as G10 and carbon fiber composite to create unique custom tactical edged tools. All knives are hand crafted without any CNC work involved, except crucial precision elements such as the pivots and stop pins. For more information on the specification and ordering please visit the ABOUT page. You will find the list of available models in the MODELS section - these are all the knives available for order, I don't accept any custom work beyond my designs. Visit the GALLERY for some examples of my work, for my most recent updates please subscribe to my Facebook and Instagram (bottom of the page). You can always contact me if you have any questions that you can't find answers to on this website - for that information go to CONTACT. Hope you enjoy my work and thank you for stopping by! Waiting list is CLOSED, thank you so much for the huge interest in my work! FULL TITANIUM, 4 new models! 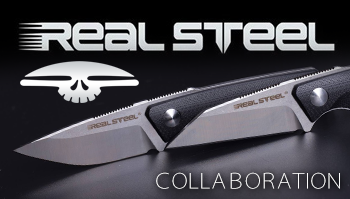 I'm proud to announce my collaboration with REALSTEEL to make some of my designs available to even more users around the world! More info will be available through my social media!